Artists find inspiration in many places, including Call of Duty’s remastered Zombie maps. The Zombies Chronicles DLC for Black Ops III launched on May 16 inspired visual artist Travis Simpson to create some super-detailed Zombies themed paintings. The idea originally spawned from wanting to paint a Zombies themed piece to look good in a game room, he told Kotaku. 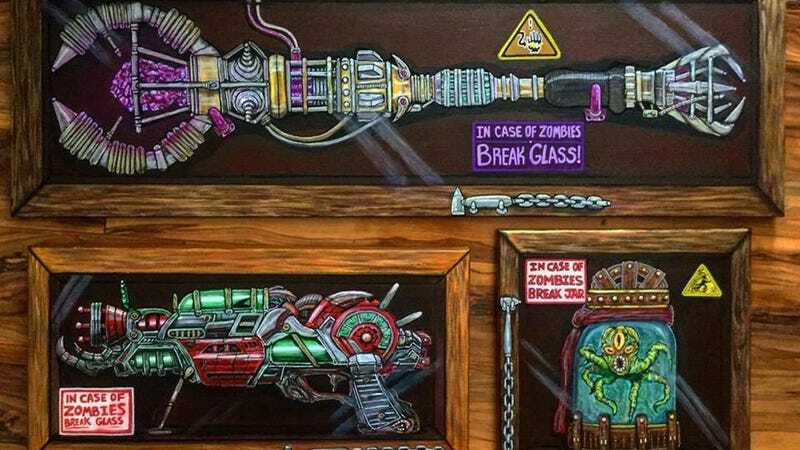 Starting with the Ray Gun Mark II, Travis wanted to create the illusion of a collectible in a shadow box while painting acrylics on a 24”x12” canvas. Once the Ray Gun was complete, he posted the painting on social media, scoring nearly a thousand upvotes on Reddit, which gave him the push to do more. The Electric Staff from the Origins map was painted on a 36”x12” canvas. Li’l Arnie, the tactical Wonder Weapon from the Shadows of Evil map, was painted on a 12”x12” canvas. Travis is hoping to paint more Zombies themed pieces as he patiently awaits the release of “Zombies Chronicles” on Xbox One later this month. You can follow Simpson’s work on Instagram or find his prints for sale on Etsy.